Crater Lake in one word is stunning. Imagine driving up a former volcano, barren of life, turning around the corner and seeing a massive, beautifully blue lake surrounded by steep cliffs that make up the crater. 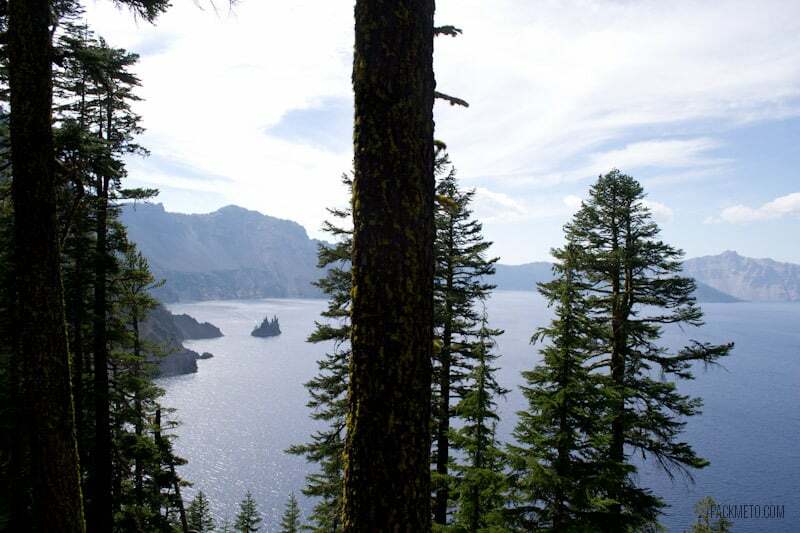 You don’t have to imagine, because it’s real and you can see it at Crater Lake National Park. 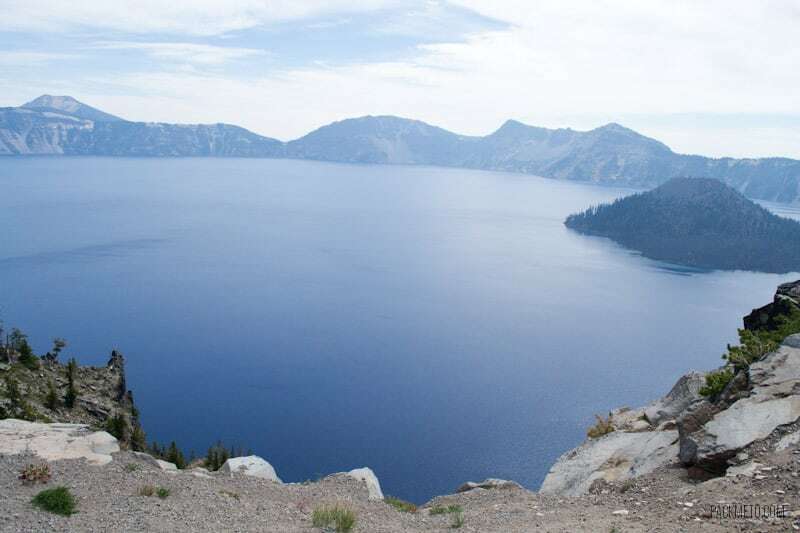 7700 years ago, Mount Mazama erupted and collapsed on itself, forming a large caldera which was later filled in with water. 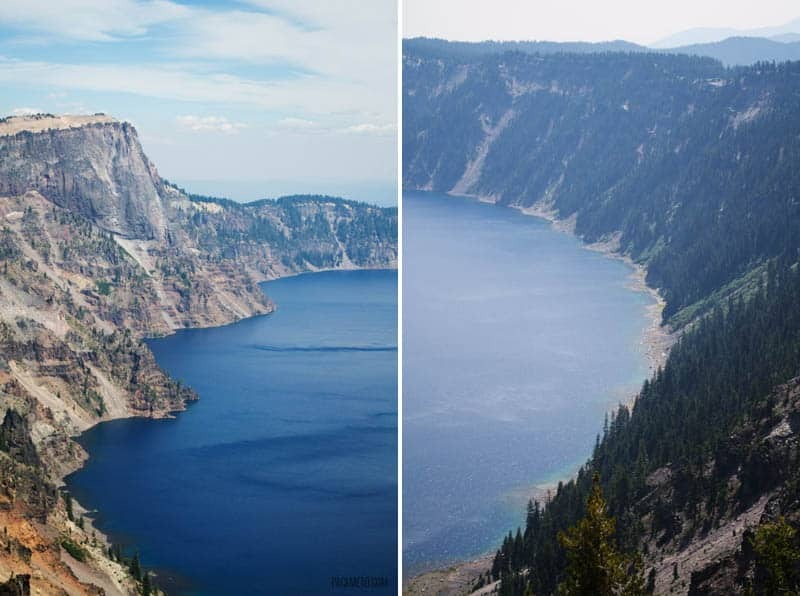 Crater Lake is 1,943 feet deep making it the deepest lake in the United States, and the ninth deepest lake in the world. The water is so strikingly blue because there is virtually nothing else in it. There is no sediment, algae or pollution to dilute the colour our eye sees. 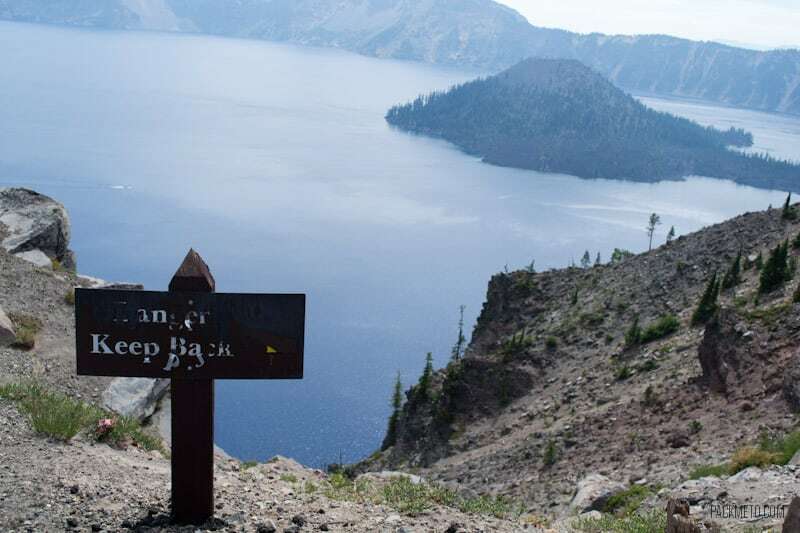 The best thing to do with only a day at Crater Lake is to take a leisurely drive around the rim. The Rim Drive is 33 miles long (53 km) and has over 30 overlooks to admire the lake and surrounding features. They estimate that it takes about 2-3 hours to drive around the crater with stops and an hour if just driving the whole way through. A fantastic place to have a picnic no? We had the misfortune of going when part of the Rim Drive was closed due to construction work. In the weeks leading up, some loose boulders had come crashing down on to the road and while no one was hurt, they didn’t want to risk it happening with cars driving in the area. As a result, we drove the rim essentially twice because we had to double back a couple times. There are a number of highlights to see along the way. A lot of the overlooks are not well marked so we ended up missing a bunch of them that are highlighted by the park. When we entered the Rim Drive, this was one of the first things we saw. It was absolutely stunning and we pulled over right away. One of the unmarked overlooks, we weren’t exactly sure what we were looking at, but it sure was beautiful. Don’t have to tell me twice! The first thing I noticed was just how steep the side of the crater is and that I definitely didn’t want to take a nose dive down the side of it! 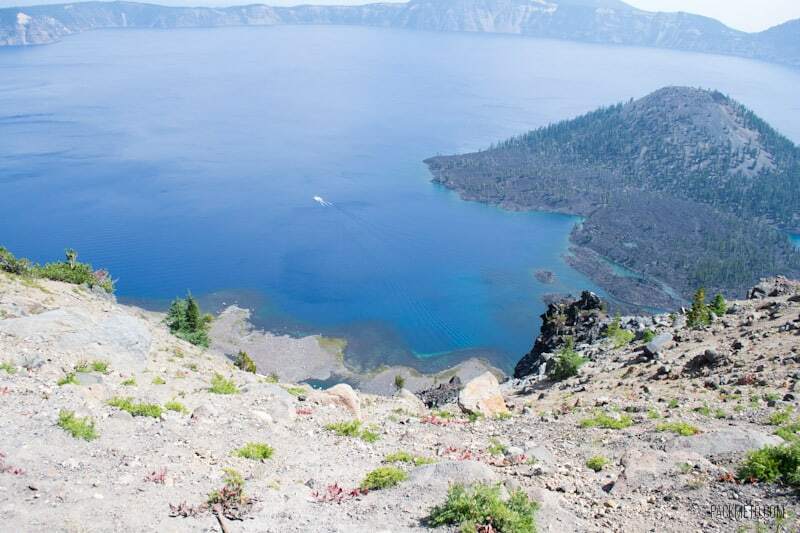 This area over looks Wizard Island which sits on the west side of Crater Lake. 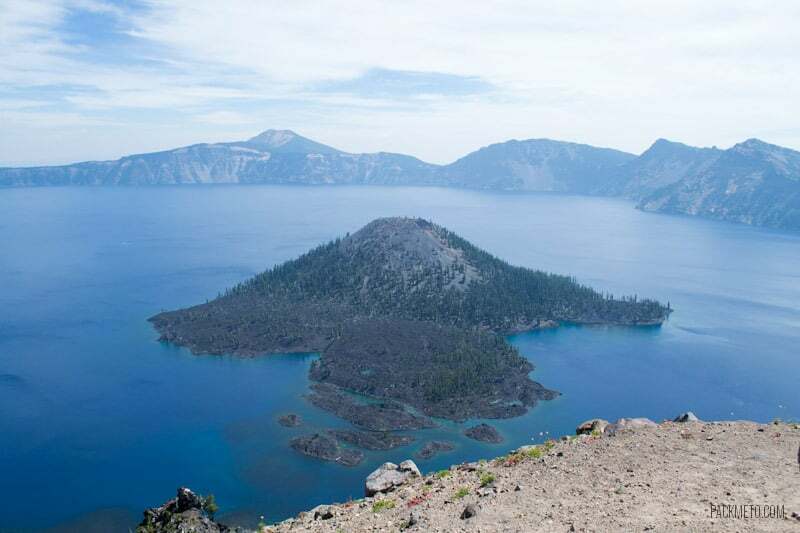 Wizard Island was formed as a result of a smaller eruption of Mount Mazama and is actually a volcanic cinder cone. Doesn’t it sort of look like a wizard’s hat? Times like this I wish I had a telephoto lens. 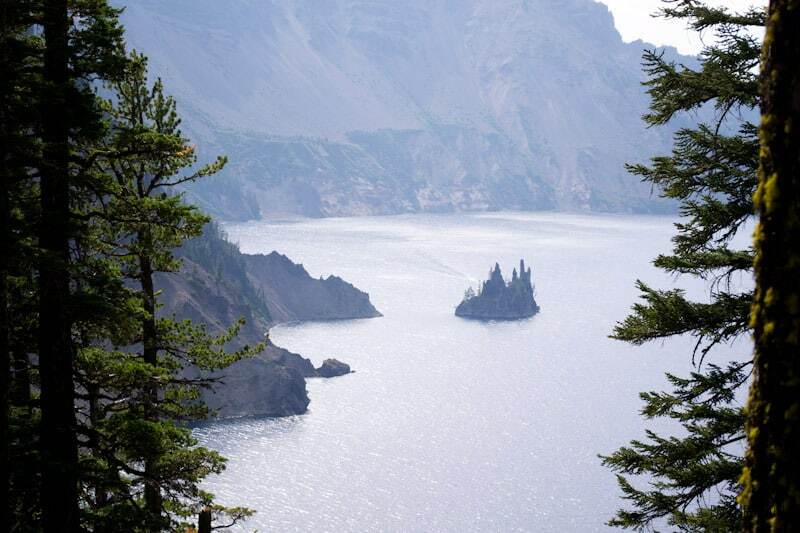 On the east side of Crater Lake lies a rock formation that resembles a ship. While from a distance it looks to be rather small, it’s actually the height of a 16 storey building. It formed from erosion resistance lava and is thought to be over 400,000 years old making it to be the oldest exposed rock within the lake. How crazy! It definitely looks like a pirate ship to me from a distance. 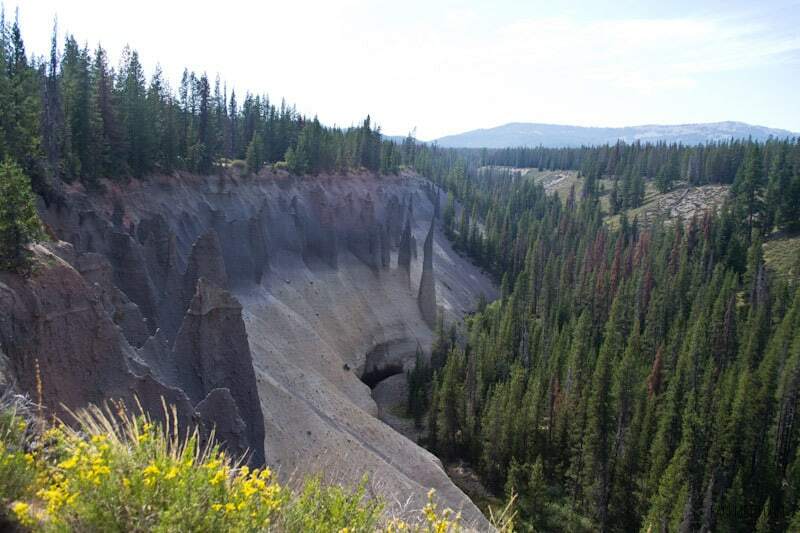 While not strictly on the Rim Drive, this is well worth the side trip to see these interesting rock formations. 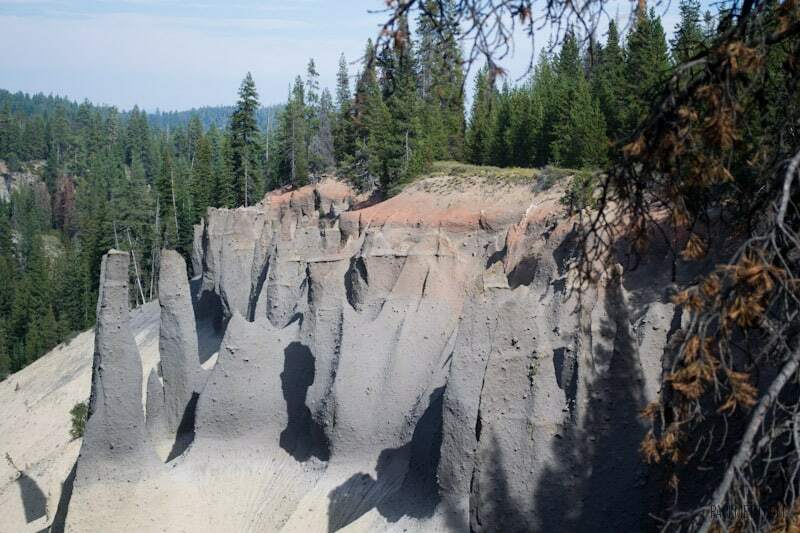 These rocks, called fossil fumaroles, were formed as a result of volcanic pumice before Mount Mazama erupted. As the surface of the pumice cooled, hot air became trapped underneath. This hot air needed to be released somehow. Minerals in the air and the extreme heat caused the ash that moved through the pumice to turn into rock. When the canyon walls started eroding away, these spires remain. 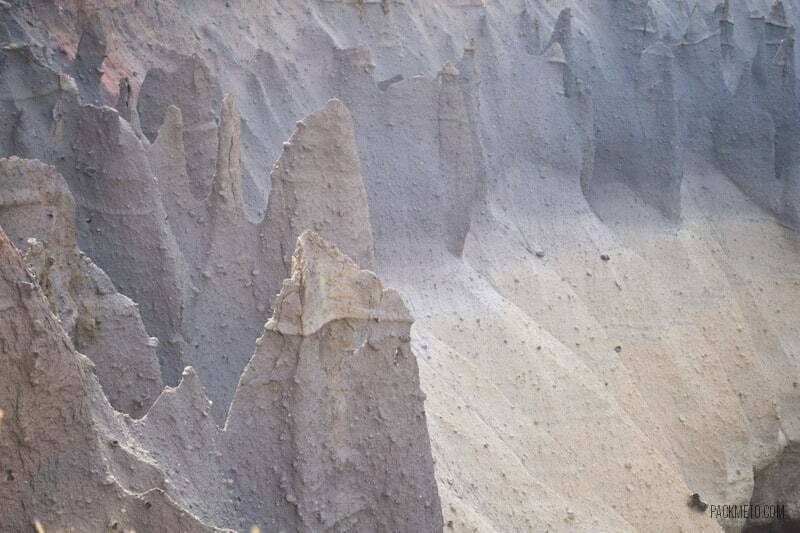 Today these spires can rise up to 100 feet tall (30 meters) and many of them are hollow. The trail is an easy walk, but be wary of the wind. When it comes, it blows sand everywhere. I had so much of it in my eyes and nose. At least it was nothing like the amount of sand while I was on my sand dunes tour though. 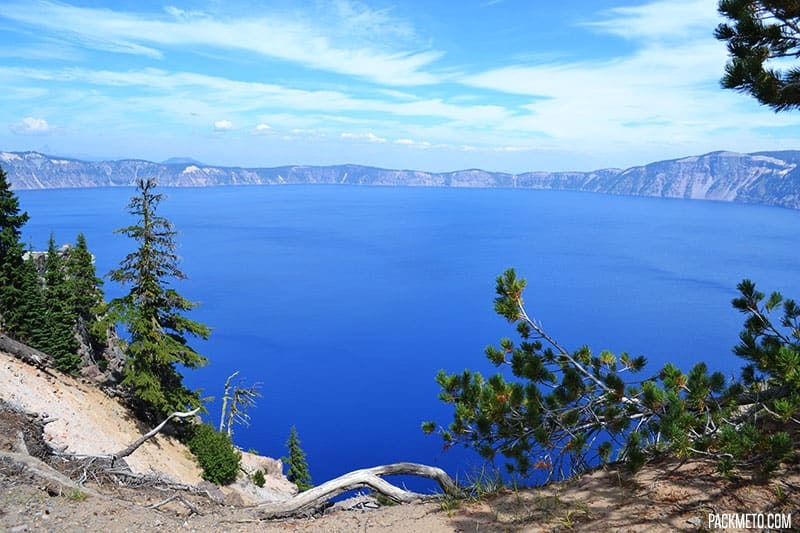 The vibrantly blue waters of Crater Lake look so inviting doesn’t it? A number of people have asked me since if it was possible to go swimming. There is only one route down to the lake and it is through the Cleetwood Cove Trail. The trail drops nearly 700 feet in 1.1 miles. There is the option to swim in that area, but I would envision the water to be a bit chilly! We didn’t have time to go down and back, but most importantly, I didn’t want to make the massive trek down. It’s so steep! To get an idea of the trail and of the boat tour that launches from the end of the trail, check out this fabulous post from Mary at The World Is a Book. You can see a boat on the lake on its tour. There are also a number of hiking trails that you can use and in the winter, the park is open to snowshoers. There is a visitor centre located on the south side of the park. This is also where the Crater Lake Lodge is in case you’re interested in staying overnight at the park. Prices, when we looked, were pretty reasonable, but they book up quickly! The visitor centre organizes special programs throughout the day so that you’re able to learn a little more about the park. In case you don’t want to drive yourself all the way around, there is a trolley tour available. Due to the limited accommodation options in the park, we opted to stay in the nearby city of Roseburg. We went with the Super 8 in the city and was pleasantly surprised. You can check out my full review in this post here (scroll down!). I really enjoyed my stay and definitely recommend the Super 8 Roseburg as a budget-friendly option if you’re headed to Crater Lake. Please consider booking your accommodations through the included link. There are no additional costs for you and it helps support this website. 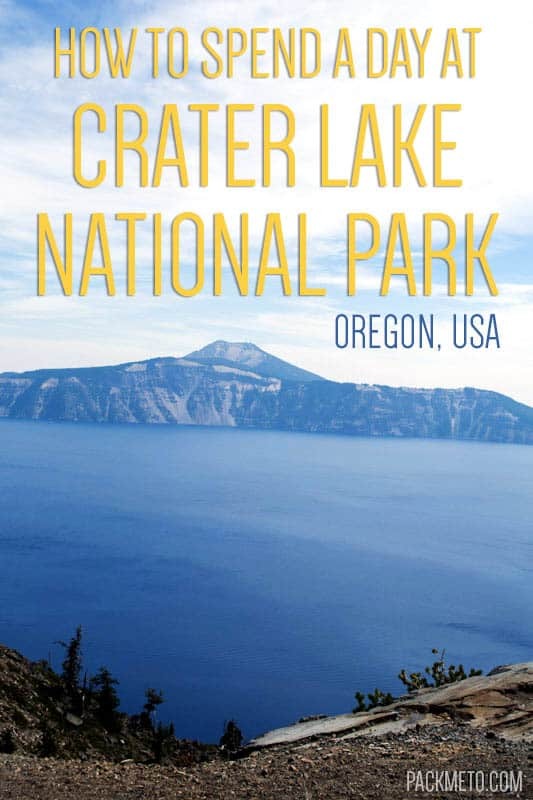 Have you been to Crater Lake National Park? Did you like it? What other beautiful national parks have you been to that I should go visit? There are numerous entrances to the park, but it is quite far from any towns. Be sure you have enough gas to get you to the park, around it and then on to the next city. There is a gasoline station in one part of the park if you desperately need it. The drive from Roseburg to the park is about 2 hours and you enter from the North Entrance. The route takes you through a lot of forested area so be prepared to not have any cell reception. Even throughout the park, it was very limited and there is no (free) wifi. Entrance fee to the park is $10. Although the park is open year round, the Rim Drive is only open part of the year during the summer months. In addition to the drive there are a number of hiking trails to explore on foot. The park also offers guided walks. There are places to get food in the park, but I would recommend stocking up at a grocery story before hand and having a picnic overlooking the lake. There are plenty of spots with picnic tables. Amazing place! I love water and mountains and nature and this seems a perfect combination of them! Thanks for sharing! Each picture just kept getting better and better! SO beautiful! At just $10 entry I think that is a great spot to take a gourmet picnic and spend the day! Wow this looks like a beautiful place! I would love to spend there a day 🙂 Thanks for sharing the stunning pictures! I don’t think that water could get any more beautifully blue! Your photos are just stunning; well done. Crater Lake looks awesome. You got some AMAZING shots! Had plans to make it here this year but they fell through. Hoping to make it there next year! Photos look great. Wow! I need to take some time and explore the US more. So incredible. I haven’t been back to Crater Lake since I was a kid. I remember doing a report on it in school and then begging my parents to take me there because it sounded so cool. Unfortunately, I don’t actually remember any part of the trip, so your photos are a beautiful way to reminisce. That really does look like a pirate ship, and it’s hard to imagine that it’s actually 16 stories high. That gives me an idea of how immense that lake and those steep sides are. I find it hard to imagine the rock being 16 stories high too. It seemed so so so small! That’s so true. All you really need to do is see it from each side for a different perspective and then you’re good. There are a lot of pretty cool rock formations throughout the whole park. The pinnacles were really unique though. Beautiful description of the Crater Lake. We visited the area about 20 years ago and we were as impressed by it as you were. I didn’t realize though that there were no algae in it. Does that mean there is no life either? There are fish in the lake, put there by humans so they’re not native. You’re not allowed to fish them though. I don’t know what they eat to survive though, but must be something! Wow, those pictures are unreal! I have never heard of this but now I want to go!!! It really is beautiful! Photos don’t do it justice. You definitely should go see it in person!